CasinoEuro Review - Can You Trust CasinoEuro in 2018? 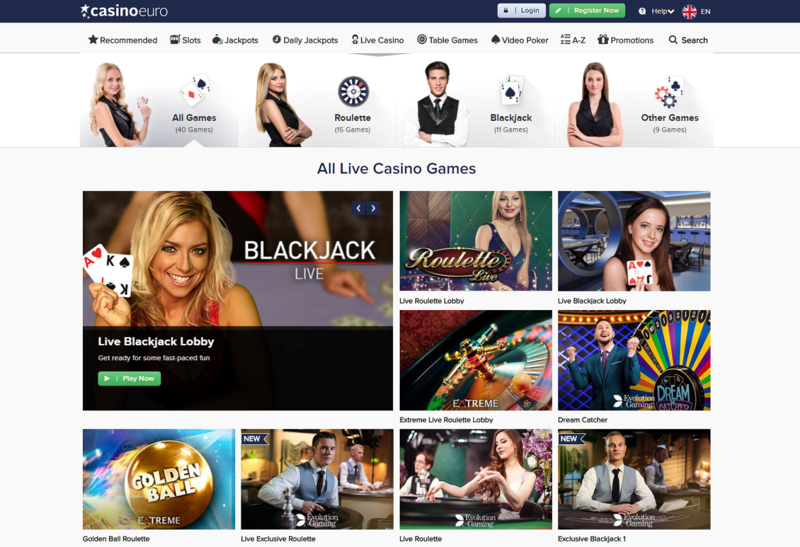 Casino Euro is a fantastic site that has been around since 2002. This long-standing casino brand is owned and operated by the BML Group. This company, based in Malta, is the company that is also behind the Betsson, Mr. Smith, and BetSafe brands. You may recognize some of those brands; they are some of the most respected names in the online gaming industry. Casino Euro has received gaming licenses from both the Malta Gaming Authority and the UK Gambling Commission. Having these two jurisdictions on board is great for players; the financial due diligence performed will put people at ease when it comes to their deposits being safe. Also, the games are certified to be set up with fairness in mind; the Random Number Generators are tested by a third party to ensure they are up to industry standards. Well, unfortunately, American players are not going to like what they see when they look at this map. First off, you could have probably guessed that a casino draped in the European Union colors and with a name like CasinoEuro wasn’t going to be focused on this side of the Atlantic. This is confirmed by the fact that as a side effect of having those two gaming licenses, U.S. players are not able to play at this site. Is CasinoEuro Legit for U.S. Players? Definitely not. You cannot play here, so there is no reason to discuss its legitimacy for U.S. players any longer until there is a significant change in the legislation in the States. Well, no one can claim the slots catalog is lacking at CasinoEuro. 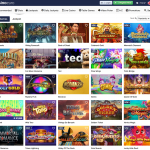 Backed by content from multiple suppliers, there are at least 700 different slots games to play. 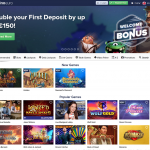 From classic looking 3 reel games to the best-licensed content, you are going to be pleased with what you find at this casino. For us, we like to add a little Rock ‘n Roll to our gaming experience; give the Kiss-themed slot machine a try right here! KISS® Shout it out Loud! 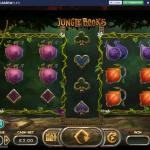 You will be hard-pressed to find a support area of an online casino as thorough as this one. 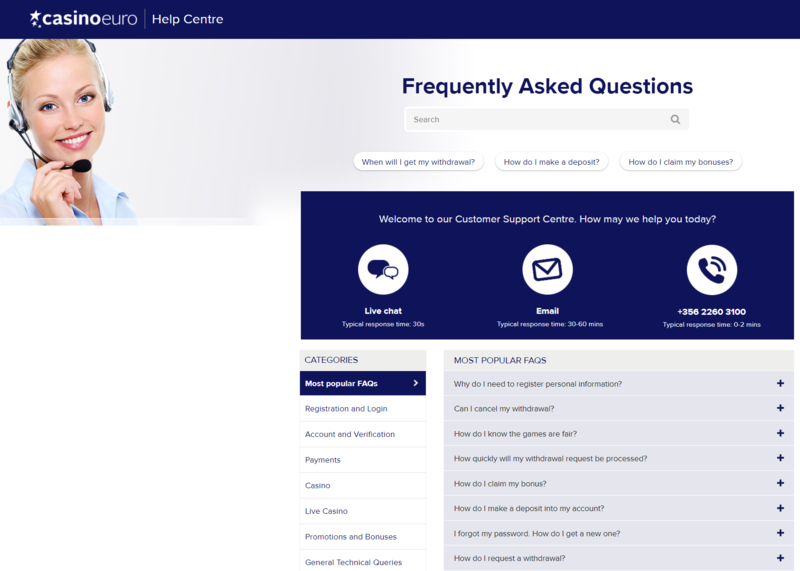 Let’s start with the fact that they have an FAQ section that is fully searchable; there are hundreds of pieces of information that likely solve over two-thirds of the general queries. Failing that, you can reach the casino in real-time via Live Chat or by telephone (long distance charges are likely going to apply). Finally, if you want to lay out your concern in detail, you are best served to send the company an email. 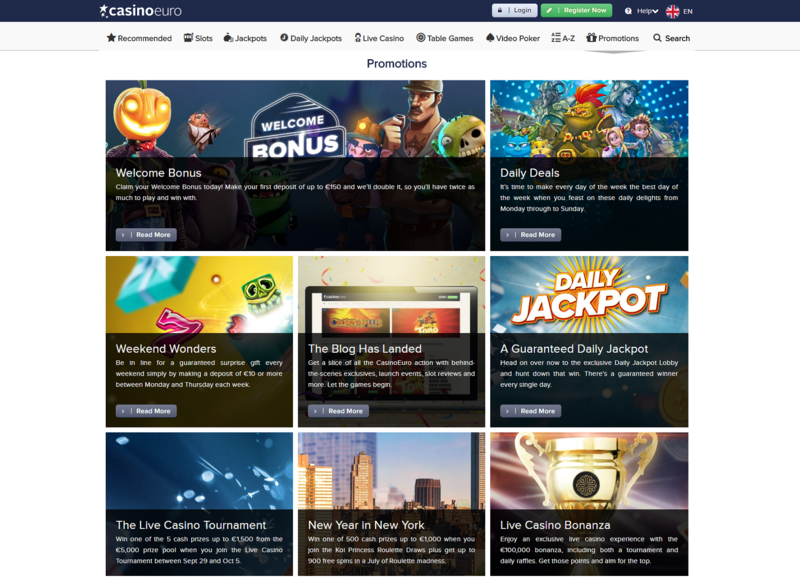 The casino offers a multitude of promotions for you to take advantage of; given the level of detail in other areas of the casino, it isn’t really a shock to see the marketing team step up. Let’s look at a couple of them in more detail. Now, while this is far lower than other Welcome Bonuses you may see, let’s take a couple of things into consideration. 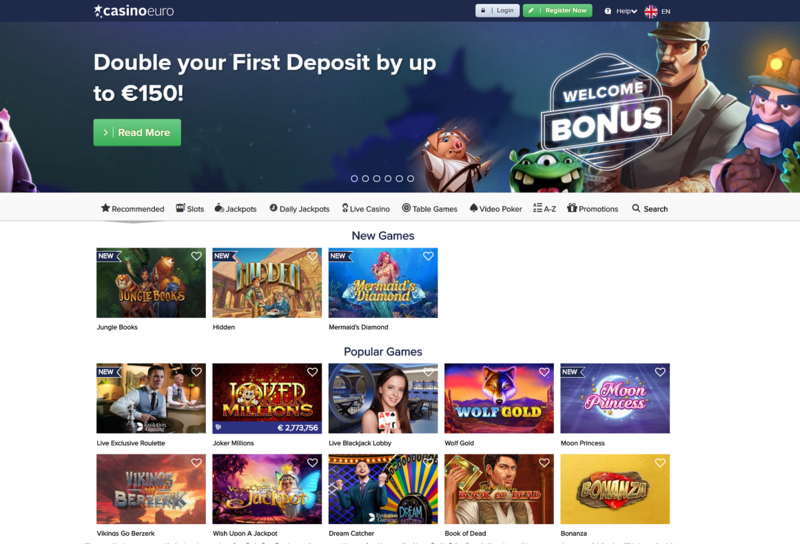 First, the casino isn’t interested in just getting you to deposit once, as you can see by all the Daily Deals they have listed on their promotions page. Also, the wagering requirement for this bonus is 40x the bonus amount; this is slightly better than many of the casinos we have reviewed, so there is some value there as well. 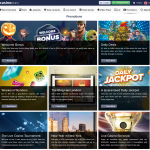 Overall, it’s a fair bonus for a site that is focused on your longevity as a player. With the new Daily Jackpot feature in the Daily Jackpot Lobby, you can hit it big every day on some of the most enthralling and fun Red Tiger games. A jackpot is guaranteed to fall before midnight every single day, so the later it gets the more chance you have of winning. However, you won’t have to wait until midnight as it could fall at any time. So, hit the Daily Jackpot Lobby, land 3 Jackpot symbols on the reels and watch those jackpots drop. A jackpot a day keeps the boredom away. For those of you who are trying to make a deposit at this casino, you should have no trouble given how many payment solutions are offered. From standard credit cards to e-wallet solutions, you are covered. Personally, I always use e-wallets when I have the chance; even though they take a little longer to set up, the payments come much faster than bank wire or credit cards, and that is what matters most to me when I am playing online! 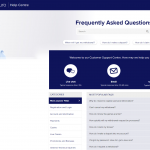 At present, it does not look like CasinoEuro offers a VIP program. This seems a bit odd; a casino with so many other great things to offer its players doesn’t think having VIP Status matters? We can tell you that indeed it does (we hear about it all the time from our readers). Maybe it is just a private program, and you will be contacted when you achieve the appropriate level of play. 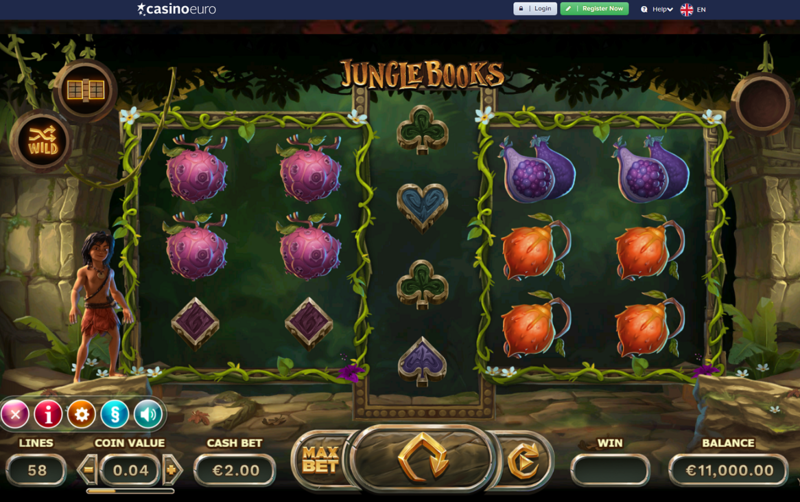 CasinoEuro is one of the most well-rounded casinos we have ever reviewed. 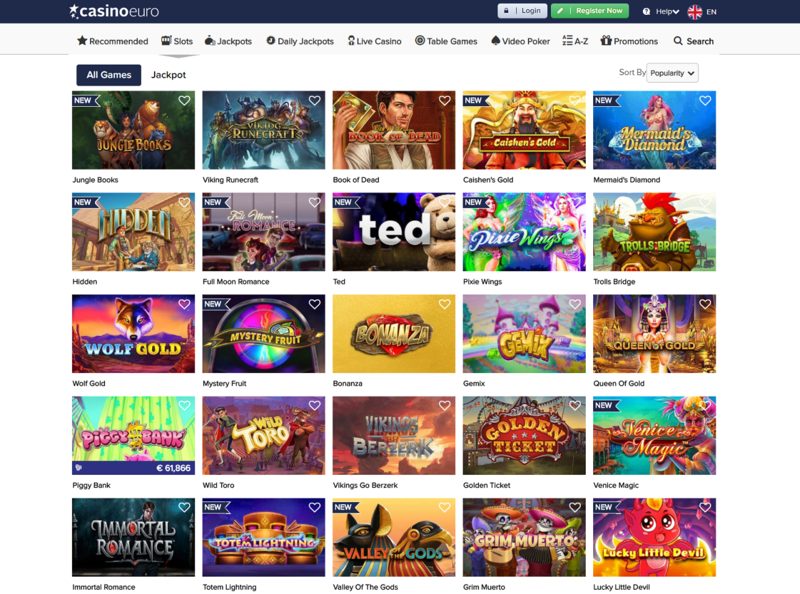 Aside from being backed by one of the industry’s best-known names, the casino has over 900 games available for you to play. While the lack of a VIP program is disturbing, and the Welcome Bonus is not nearly as aggressive as many of their competitors, that won’t matter once you are inside the casino lobby. Having 32 Live Dealer games puts this casino in a league all of its own. Overall, this casino gets two thumbs up from us at Legit Casinos Online. It is truly disappointing that you cannot access the games from the U.S., but for those of you who can, we highly recommend you check it out.